Are you a designer? Are you on Instagram? If you work in the design industry and you are not fully leveraging the most visual of social media platforms, you are missing a big opportunity. All design industry professionals, from architects and interior designers to design show hosts and furniture house heads, can easily integrate Instagram into their social media strategy. One of the benefits of working in the design industry is that your everyday routine is ripe with photographic opportunities. Capture and share the fun details of your industry by keeping your smartphone close by as you scour your local antiques market, finalize design boards, and complete installations. 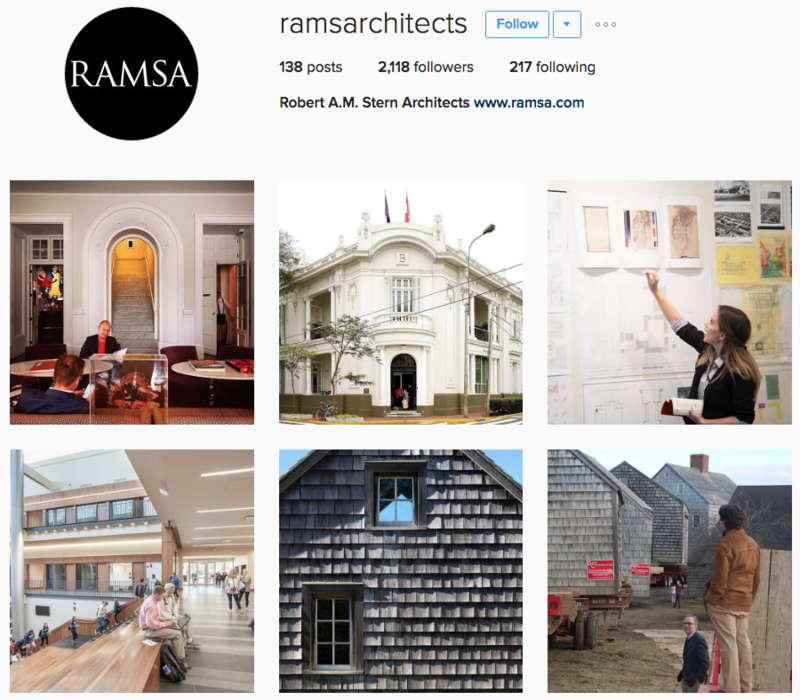 Robert A. M. Stern Architects share an interesting mix on Instagram. Your business has a signature style. Why doesn’t your Instagram? As with all social media, consistency is key. If you are known for classic clean lines and traditional proportions, this should spill over to your Instagram feed. Play around with Instagram filters and frames to find the look that seamlessly integrates with your business. You don’t need to stick to one filter, but refrain from mixing opposites (please don’t switch willy-nilly between LoFi next to Sierra). If you like a clean white frame, use it for every picture for an organized and symmetrical feel. Avoid making a big branding mistake by paying attention to detail and using your brand voice for every post. Your followers want to peek behind the curtain and see behind-the-scenes material. This can be accomplished with a variety of posts. Sharing industry “secrets” is a simple way to build brand loyalty and give your audience tangible value. If you are an architect, think along the lines of sharing a quick trick for nailing proportion, or your favorite exterior paint colors. An interior designer could share a tip for removing tough stains from pillows, or their favorite tile pattern hacks. You get the idea. Share what you know and remember, you can never give away too many industry secrets. Your audience will come back again and again in hopes of gaining insight into a topic they love! Schumacher crushes it with color on Instagram. Tell a story to keep them coming back for more. Are you an interior designer working on a huge ground-up project? Create a unique hashtag to organize all of the related photos for the project. Additionally, tag any other professionals and design peers you are working with from fabric houses and painters to landscape architects and masons. Create a flow of behind-the-scenes content that unites the different elements of the project into one cohesive and digestible story for your audience. Your followers will love tagging along, and especially love it when you keep it real by including real life mishaps on the job! You don’t want to draw attention to any errors on your part (or the part of your peers), but funny snafus like a sofa so big that the door has to be unhinged to bring it in… now that is good material. Plus, it shows a personal and human side to your business. Shake it up. Show a variety of material, from the planning stages to completion. Share exciting company announcements (you are opening a new office in Chicago!) and tidbits of your company culture (meet our new intern, Adam!). Support your community by cross-promoting and even teaming up for giveaways and prizes. The more you mix it up, the more likely you are to leave your audience begging for more! Instagram is the design industry’s best friend. Take advantage of the social media platform that allows you to show what you do in the best way possible, through pictures. 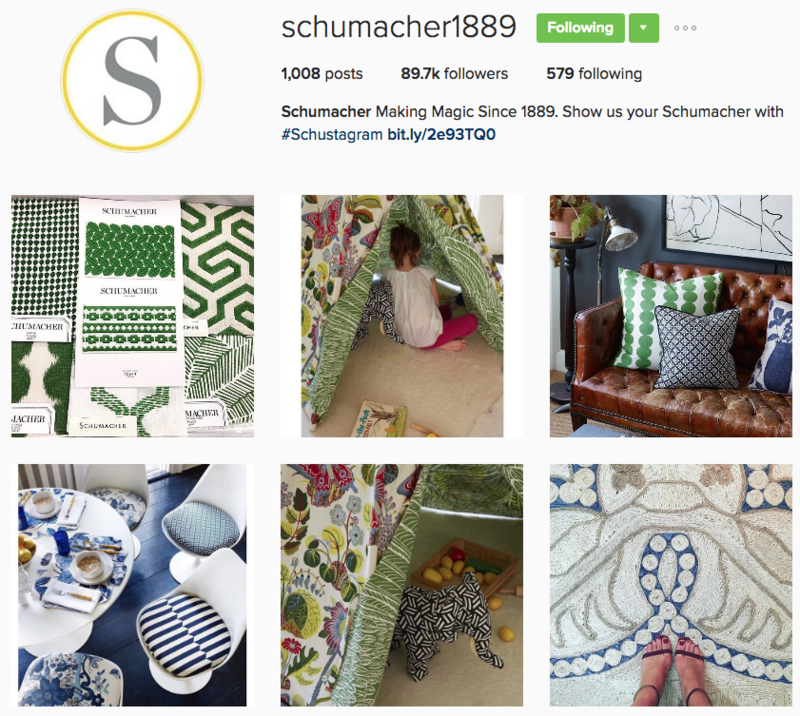 If you need inspiration, look to the Instagram accounts of your industry leaders. You should be following them anyway! Finally, remember to engage with your audience in a meaningful and personal way. If someone asks a question, respond with the best answer at your disposal. If the question or answer is complex, ask them to direct message you their email so that you can best follow-up! As with all social media, follow the best practices for inbound marketing to attract, engage, convert, close, and delight your target audience! Find even more accounts to follow via this round-up of the top architecture Instagrams from Huffington Post or this Harper’s Bazaar slideshow featuring their picks for top interior designers on Instagram.